How is it that certain persons can radiate an irresistible fascination? How is it that some can effortlessly get others to do as they please  willingly? Why do some, seemingly effortlessly, get ahead whilst the rest of us struggle to get by? What is the secret of this mysterious quality  fascination? How can one acquire it without appearing to be pretentious? Well, it can be acquired. It is a secret known only to a certain branch of occultism. Fascination, however, has little to do with looks and physical appearance. Fascination transcends the mere superficial. With this highly charged formula you can go from being completely ignored to being in demand and sought after by others. This goes beyond self-confidence. With this formula you can actually experience a tangible POWER. This power is irresistible! It acts like a magnet to others! It doesn't matter what you lack; it matters not if you have no looks, no money, no talent  when one acquires true fascination the world can be at your feet! As a young man Adolph Hitler was a nobody, considered a little odd by those who knew him, and otherwise of no consequence whatsoever. He had little self- confidence and he couldn't make it with women for the life of him. He was awkward and self-conscious. and he could not be described as the handsomest of men. Yet he would emerge later as a charismatic leader, oozing power and commanding the fanatical devotion of so many. Women adored him and he had to be constantly protected from their advances. He was the epitome of the fascinating person. Hitler was known to be an occultist and it is certain that the formula he used to acquire fascination and effect his personal transformation was very like or identical to the one here. Of course few would want to be a dictator or end up on the slippery slope to megalomania, but any intelligent person sick of being ignored and being taken for granted would want to know how Hitler did it. You can now know. You can possess this secret. THIS IS HIGHLY POTENT. ANY WOMAN OR MAN REGARDLESS OF APPEARANCE  CAN MAKE HER/HIMSELF IRRESISTIBLE, RADIATING A PERSONAL MAGNETISM THAT COMPELS OTHERS. We repeat: this is more than being merely self-confident. This can make one feel invincible. People long to be of help to the genuinely fascinating person. They become like putty in his or her hands. Does all this sound like wishful thinking? A pipe dream for those feeling inadequate? Far from it  this is grounded in arcane magickal practice. It is not a gimmick; neither an entertainment. 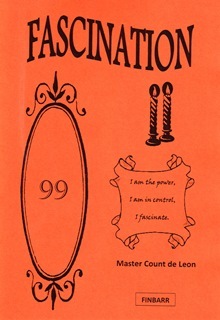 Drafted by occultist Count de Leon, this is a mere leaflet/booklet, but what you will find here you will not find in any 500-page book.